Marshland have been running Pub and charity quizzes in Eastern Essex since 1989 and have built up an extensive knowledge of what do do and more importantly what not to do to ensure that the people attending have a good time. Although a quiz can be put together by anyone this often results in quizzes regarded as too hard, too easy, too obscure etc. etc while a professional Quiz Master normally hits the mark of challenging but fun questions that provide an enjoyable evening whether people win or lose. This will will bring people back to the next quiz in greater numbers once the word of mouth spreads and lead to a reliable income for the organisation. You advertise the event, sell the tickets, set up the venue, organise any raffle and provide any prizes. 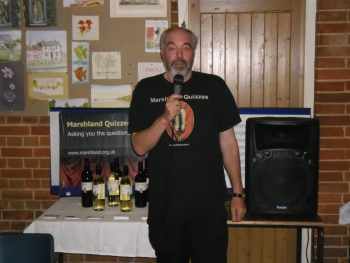 Marshland provide a question master, microphone, amplifier, projector & screen, question papers etc as required and will take over the running of the quiz from start to finish. Quizzes are a great a fund raiser. All you have to do is to book a hall advertise the event, provide any prizes for winners, set out the tables on the night, arrange a raffle if further funding is desired and collect the entrance money. Marshland will do the rest making it one of the easiest ways to raise funds for your organisation. The money raised by quizzes operated by Marshland ranges from a small quiz that made £50 to a much larger quiz where the end total was over £1,500. Most Clubs have social time or a guest speaker. A quiz is a great way of filling this period. The quiz can be geared up to an interest shared by the people i.e. 60's music, literature or it can be wholly on general knowledge. A quiz on a Christmas theme provides an entertaining and cost effective alternative Christmas entertainment for clubs to help you really get in the mood for Christmas. What do people say about Marshland Quizzes?
' Bob has asked me to write and formally thank you for all of your efforts at the recent quiz night held for charity. Over £750 was raised "
" Again many thinks - as usual a very enjoyable evening was had by all'"
" Thank you so much for the wonderful Quiz evening on Friday night. We raised £300, not to mention all having a good time as well !!" Charges will vary according to the duration of the quiz and the distance required for travel. Discounts are usually available for charitable/Non profit groups. Bookings that require a quiz on a specific subject like wildlife, 70's pop music etc may incur and additional fee to compensate for the additional preparation costs. Click here to contact Marshland. Please provide details of the location of the quiz, organising group, likely numbers attending when replying.